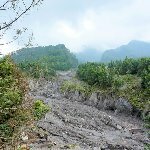 When we visited the Merapi volcano one of those eruptions had taken place a few years before and the sight was just really sad. The people who lived on the flancks of Mount Merapi had to leave their houses as the hot lava had burned it all. It was april of 2006 when the Merapi volcano erupted violantly and as if that wasn't enough an earthquake followed which completely destroyed the area around Mount Merapi. 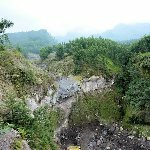 As a result the pictures taken on Mount Merapi show this empty valley of hard volcanic rocks and a large grey valley filled with burned houses and reminders of a village that once flourished thanks to the fertile land of Mount Merapi. 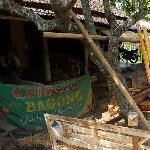 After a climb up the volcano we returned downhill where we visited a local furniture factory and had a last look around before heading back south to Prambanan. Did you enjoy Merapi volcano pictures and have you been on a holiday in Merapi, Indonesia?